“I remember what it was like to be in your shoes,” said Legend, speaking at the university’s Freshman Convocation and assuring the Class of 2016 that it’s OK to be both excited and nervous. 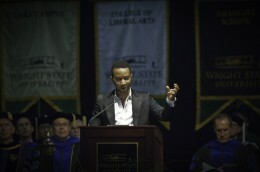 Photo of John Legend performing on stage at Wright State's Freshman Convocation 2012. 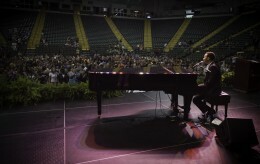 After his keynote address, Legend took questions from the audience and performed three songs. More than 3,600 students will begin their higher education at Wright State this fall; more than 2,400 of them are coming directly from high school.